'The Libertarian Republic' author refers to Obamacare 'spike' in medical adminstrators before it even became law. I don't usually read 'The Libertarian Republic', but this article was shared by a friend on my Facebook feed. The author writes that the 'armies of bureaucrats' (i.e., medical administrators), necessitated by government regulation, are responsible for the rise in medical costs. The evidence presented is a figure that shows the growth of physicians and medical admistrators between 1970 and 2009. Of course, this is really only evidence regarding the ratio of physicians and medical administrators over this time period, not the associated costs of medical care. But, the most egregious part of the article comes in the last sentence. 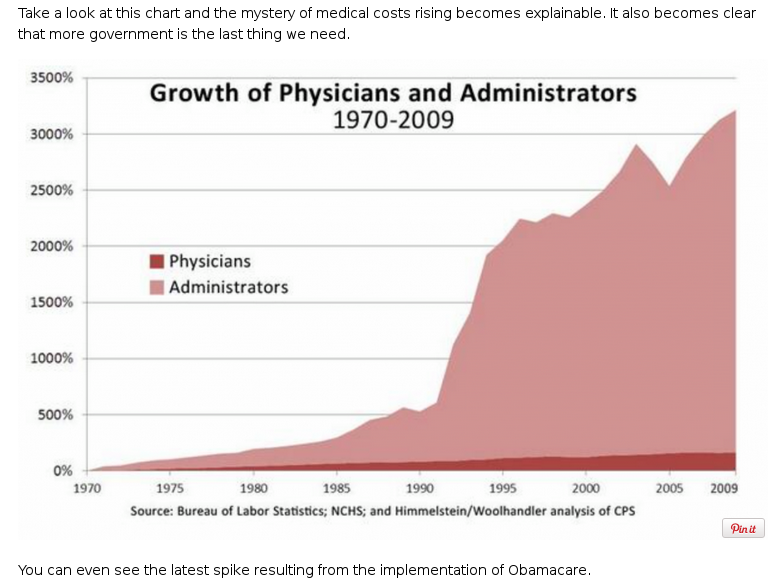 The author claims that "you can even see [in the graph] the latest spike resulting from the implementation of Obamacare." But again, the graph only shows up to 2009, whereas the ACA didn't become law until March of 2010, let alone 'implemented'. Most of its implementation wasn't complete until 2014! In addition, the 'spike' in the figure begins (roughly) in 2005; 2-3 years before Obama was elected president. Regarless of the truth of the argument that administration is responsible for the rise in medical cost, the author has made a serious blunder in attributing the 'spike' to Obamacare. The figure is reproduced below as a screencapture. P.S. Jeff Leek from simplystatistics.org visted our department yesterday and mentioned to me that he often blogs about things on the internet that anger him. Thus, this post was motivated by that sentiment. Thanks Jeff!